Iceberg will launch the Eau de Iceberg duo next month. 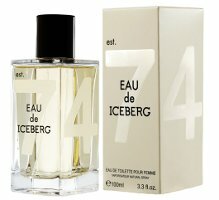 The bottle design features the number 74, for the year the Iceberg fashion house was founded. Eau de Iceberg Femme (shown) ~ a fruity floral with blood orange, pineapple, pear, freesia, fig, jasmine, white wood, vanilla and musk. Eau de Iceberg Homme ~ a citrusy vetiver with bergamot, lemon, grapefruit, sage, vetiver, geranium, violet wood, tonka bean, labdanum, benzoin and musk. Looks like the Chanel exclusif bottle, doesn’t it? The name is making me think I’d like to try it. I like things snowy, icy and cold. The notes don’t quite sound, er….ICY…..but that is ok, if it smells great, I can deal! Eau de Iceberg sounds like a joke, although I know it’s not. It does! Admit I don’t know the fashion either. Mals- LOL! Completely missed the icebrg thing. Anyhow, I think it may be a little too sweet for me. I like pear and fig, but the rest I could do without. What a shame. I was actually a little hopeful that this would be an ‘icy’ fragrance, but nothing about the notes strike me as particularly cold. Ah well. And yeah, that bottle really looks like Chanel Exclusif. For a fruity floral, the notes sound like this could be nice. I like pineapple and fig fragrances usually. And a fragrance that has sort of an icy blast in the opening is DK Delicious Night – it’s the only scent in the Delicious line that I like and the opening is really quite enjoyable and unusual IMO. Reminding me that Demeter or Brosius have a “Snow” scent that I’d like to try. Would that be “Snow” as in just the name or “Snow” as in the experience of snow? Would you know? The Demeter fragrance is basically supposed to capture the ‘feel’ of snow. I’m actually ordering a bottle of it right now as I had completely forgotten about it. Oooooooohhhhh! I think I will follow you in doing that. Not that I like to copy or anything! Just love snowy! Quite welcome. Where perfume’s concerned I feel a lot of us are lemmings. Lol. You really can’t go wrong w/ Demeter due to the prices. They have 1/2 oz. splash bottles for $6, though I’m springing for the 1 oz. spray. I’m in a winter-y type of mood and am awaiting it to get cold enough to justify the fox fur and the Nuit de Noel. Actually, I just ordered the 4 oz. from parfum1.com for $17. Figured I’d check to see where I could get more for less before completing my order w/ Demeter. I found “rain” there as well. Now I am trying both. I am so looking forward to them. Rain and Snow, how can you go wrong? Hi K. You’re ordering this unsniffed, right? Let us know how it is! Yep. I do this a lot. Rarely do I hit something that I absolutely detest, especially if it’s kind of on the bizarre side of things. Figure if I loathe it on my skin, it might still make a descent room spray. I have the Demeter Snow. I was hoping it smelled like the air does when you walk outside in the fall morning–that scent that makes me say “It smells like snow!” it doesn’t smell like that. But it is interesting. This sounds very interesting. One of my all time favorite fragrances is Icerberg Homme. Pepper never smelled so wonderful.